The cost for the City of Carlsbad to rename the street is $1,800. 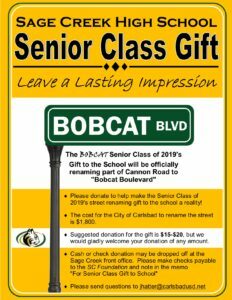 Please donate to help make the Senior Class of 2019’s street renaming gift a reality! Suggested donation is $15-$20, but we would gladly welcome your donation of any amount.